Hi everyone. Two cards for today. The first one is a Christmas card is for my good friend, Kelly. One of her favorite colors is red ... so I made this glittery red poinsettia for her ... and placed it on top of my favorite flourish die from Cheery Lynn, with some sprigs of pine. Kelly is one of my "crafty girls" group ... and she made an amazing Christmas card for me with a shiny red ornament, surrounded by a fancy die-cut border of holly and berries that is so pretty and lacey looking. Thanks Kel! I chose the diagonal line of Red, Free, Glitter for my card above (my free choice was die-cuts). And speaking of die-cuts ... they are one of my favorite things to add to cards these days. So I am also entering this into the SCS Ways To Use It Challenge (WT404 - favorite things). The second card is for my good friend, Debbie. Debbie and I met through Splitcoast Stampers and we keep in touch on a daily basis. We have a mutual obsession of stamping, of course ... but also have a similar style and inspire each other in our card making. Merry Christmas Debbie! I colored the poinsettia sprig stamp with Stampin' Write markers and then stamped onto white cardstock. I placed the punch overtop of the stamped image, centered it and then punched it out. 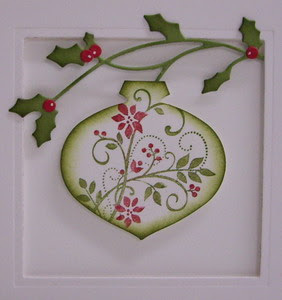 The ornament and holly vine edges are sponged with Old Olive ink to give them more depth. The ornament is popped up for dimension and placed inside the square negative die-cut card front. 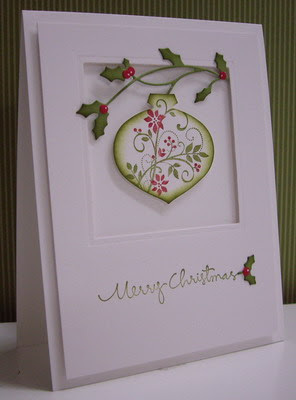 The holly vine starts inside the square die-cut and comes out through to the front. I'm entering this card into the Less Is More challenge for this week (LIM96 - red and green). Labels: cheery lynn, christmas, memory box, poppy stamps, shaping, spellbinders, Stampin' Up! Fab cards, I just LOVE the second one, wonderful design! I love the glitter you added to the flower and leaves on the first Lolly girl. and love the berries on the second. I love the Debbie card, Lolly. So pinned and so breathtaking!! both cards are elegant.I have a "fetish" for poinsettias. Keep up the beautiful work. You are so inspiring! I don'tthink I'm the Debbie this card is for, but wish I was. It's a treasure. Both your cards are amazing! 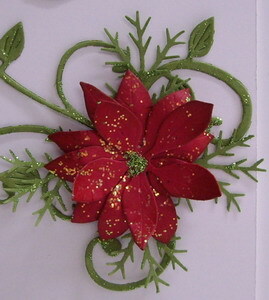 Love how you added the sparkle to the poinsettia! Just love your bauble card, the way you have the holly growing from inside the aperture is brilliant and the tree decoration looks gorgeous. Pretty, pretty cards. Wonderful designs. 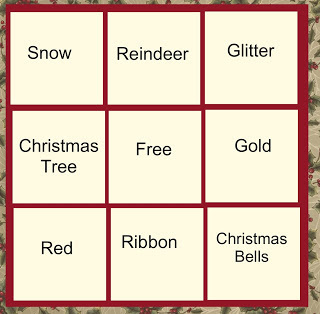 Thank you for joining us at Holly Jolly's Bingo challenge this week. Both cards are stunners. Loll! 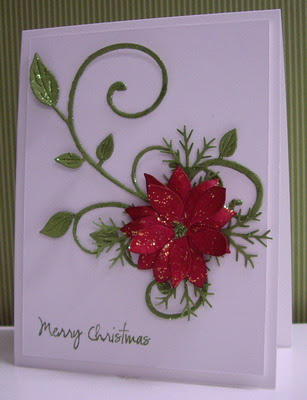 I love the added glitter on the poinsettia, and love the intricate detail on the second card. Two more gorgeous Christmas cards, Loll! I love these die cuts! And that ornament is beautiful!